Please check details of the lessons I will be giving in Spain during the event BCN&CAKE and my two-day lessons in Barcelona and Madrid following the event. Ms. Natalia Anayeva from Ireland visited my studio for a private lesson this month. 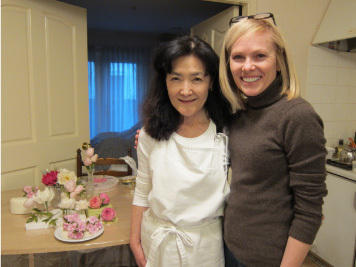 Her three-day lesson centered on sugar flowers such as dahlias, which are my specialty. Natalia is herself a professional sugar artist who also holds lessons, details of which can be found on her Facebook site CakeVirtuosoStudio. 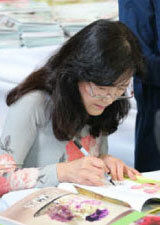 We also visited the Japan Cake Show 2013 together. Although a powerful typhoon swept across the country during her visit, it did not prevent her from having an enjoyable time while in Tokyo! 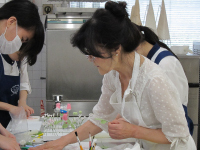 I taught an autumn-term lesson again this year to students at the Japan Special School of Confectionery. Students created a Christmas wreath cake. It was a lively and enjoyable class! I will be in Barcelona, Spain this coming November to participate in the BCN&CAKE exhibition! The sugar craft decorating demonstrations will be given in a large arena, where I will be showing participants how to create a pleated cake, using the “early spring chic” cake from my book, Wedding Cakes: The Couture Collection. 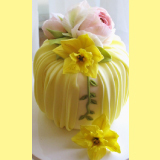 It’s the soft yellow and green frosted cake with flowered band that is shown on the front cover of the book. My lessons will be given on the second and third days of the event. On the second day. 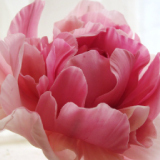 I will demonstrate how to make a lovely peony sugar flower, and on the third day I will show how to create a pleated cake. 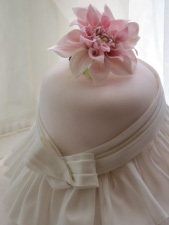 I will also give lessons on how to create a pleated cake after the event, both in Barcelona and in Madrid. I will be updating this information once everything has been scheduled. Few places still available in the 6th-7th August 2 Days Course! Please come and join the class... I look forward to meeting you all in Farnham, UK! Article on Naomi's sugarcraft published in "Hanajikan"
Naomi was interviewed about her sugarcraft work in an article published in the June 2013 summer edition of Hanajikan magazine. 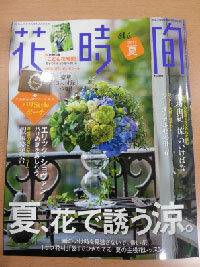 Hanajikan is a popular Japanese magazine featuring flowers and everything about them, from flower arrangements, to shops and restaurants, to flower gardens around the world. The photos alone are both beautiful and inspiring. pp124 - pp129 "Interview with Naomi Yamamoto in her atelier"
I will be holding master classes in August. Please check the Squires Kitchen website below for more information. 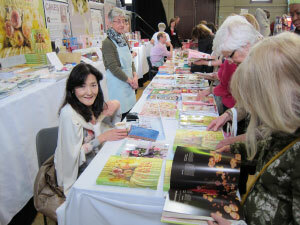 I look forward to meeting you all in Farnham, UK! "Day 5- Giant Dahlia with Naomi Yamamoto"
A five-day sugarcraft course was given by guest tutors from March 18 to 22, right after the Squires Kitchen 2013 Exhibition. I gave a one-day lesson on Tuesday March 19. The guest tutors are top artists in their field and the course is very popular among students. Many students were from abroad. It was a lively class with students speaking in their native languages—English, Russian, Italian, Spanish—and yet everyone seemed to understand each other very well. Language is not a barrier when working with sugar! The coverings were beautifully done and the dahlias where excellently finished by these professionals from many nations. We ran out of time and could not finish all the frills, but had lots of fun. For those of you who missed this class, come and join our next class in August. The celebrated, long-running 27th annual cake decorating and sugarcraft exhibition, SQUIRES　KITCHEN 2013 EXHIBITION, was held from March 15 to 17 at Farnham Maltings, UK. 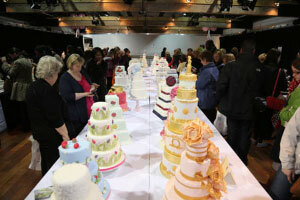 The venue was filled with participants and sugar craft enthusiasts from around the world. 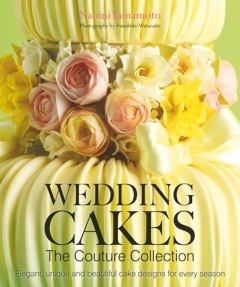 My new book, "Wedding Cakes: The Couture Collection", published on March 15, was available for sale on the first day of the exhibition. 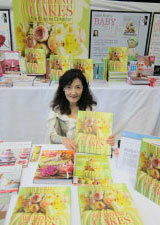 It was a wonderful opportunity to introduce my new book to the many people who visited the booth. I'd like to thank each and every one of you who bought it, with the hope that you will enjoy both the text and the photos. You can now purchase your own copy of the WEDDING CAKES: the Couture Collection from the SQUIRES KITCHEN website! 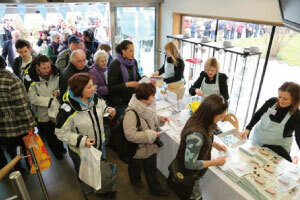 I will be present at the SQUIRES KITCHEN 2013 Exhibition, held from the 15th to the 17th March in Farnham Maltings, Surrey, UK. My new book will be on sale from the 15th, and I will be signing them during the exhibition. Please come and visit the book stand. I look forward to meeting you all! 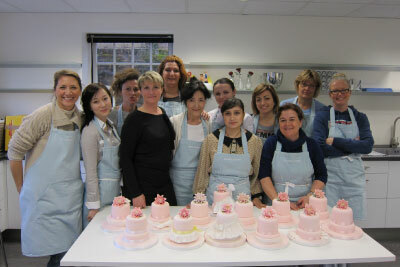 There will be a five-day sugarcraft course given by guest tutors at Squires International School from the 18th to the 22nd March. Five guest tutors are top artists in their field and the course is very popular amongst students. I will be giving a lesson on the 19th. The class is fully booked, thanks to those who have signed up. I do hope those who missed the chance this time will join my next class. 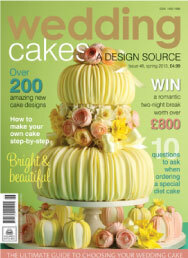 The cover page photo of "wedding cakes - A DESIGN SOURCE" Spring Issue 46, published January 2013, is used from my new book's cover! "wedding cakes" is a gorgeous magazine with hundreds of wedding cake designs collected from around the world. Do have a look, you can purchase a copy from website below. I held a private lesson at beginning of this year that was both fun and inspirational. Ms. Jacqueline Butler from San Diego, California, U.S.A. came to my studio and we enjoyed spending four days of lessons very creatively. 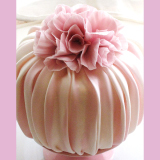 Ms. Butler is a very popular professional cake designer known for her modern and stylish designs based on beautiful sugar flowers. 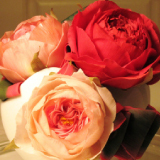 We made peonies, double-flowered cherry blossoms, tulips, English roses and dahlias. 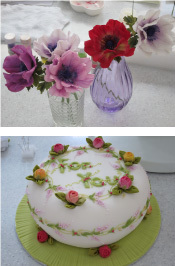 She was a real pro and knew exactly what to do to create absolutely fantastic sugar flowers. A perfect sourcebook of unique, inspirational sugar wedding cakes for all sugar artists, cake makers and brides-to-be. This new book will be on sale in Japan from Kinokuniya Book Shop starting April 2013. 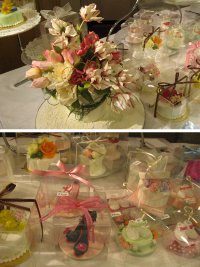 One of my cakes was on display at the Sweets Art Exhibition 2012 held at the Imperial Hotel in Tokyo. The theme for this year was "FANTASY." All cakes and sweets displayed had to be “real” edible sweets. The idea for my cake, which represents a treasure coffer, is based on The Snow Queen, a well-known Hans Christian Andersen fairy tale. 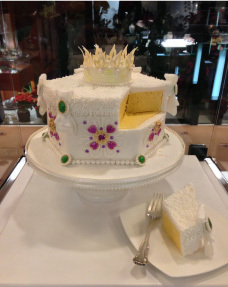 A piece of the cake is cut, as shown in the photo, so that people could see that it was a real baked cake. There were many other wonderful works of edible art displayed at the exhibition, created by talented confectionary artists. 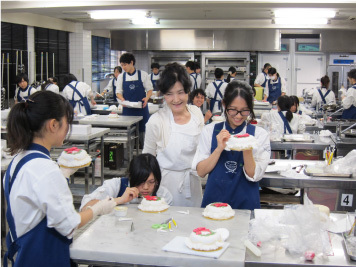 I gave an autumn-term lesson to students at the Japan Special School of Confectionery. Students baked their own cakes, covered them with sugar paste, applied frills to the sides and then topped them with Christmas wreath decorations. It was a most enjoyable class! 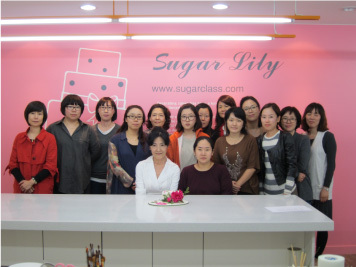 I was delighted to be invited to give a lesson at Sugar Lily’s lovely new studio in Seoul where I provided lessons and demonstrations for four different sugarcraft projects. Everyone was dedicated and finished their masterpieces to perfection. Each time I visit Sugar Lily, the number of Japanese-speaking students seems to increase - very impressing! Ms. Summer Pruett from Austin, Texas, U.S.A. requested a private lesson during her holiday visit to Japan in June. 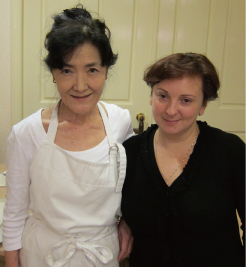 I held a special two-day lesson for her in my studio. 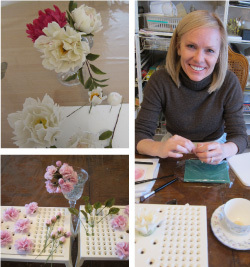 Ms. Pruett is a professional sugarcraft artist who creates beautifully decorated custom wedding cakes. Although lesson time was limited, all students were able to finish their creations in time to put on a fantastic display. On behalf of all of our staff members, I’d like to express my deepest appreciation to each and everyone who visited our table at the Hotel Okura Tokyo’s 12th Annual World Gardening Fair charity event from May 1 - 6, with special thanks to those who purchased sugarcraft gifts. We hope that we were able to introduce you to the charms and delights of sugarcraft art. Please access our website for news of future events. We look forward to meeting you again soon. 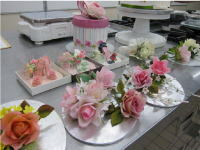 Naomi’s sugarcraft will be on sale at the Hotel Okura Tokyo's charity event! 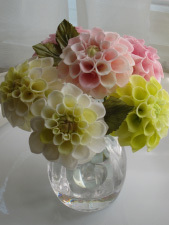 You will be able to find lovely sugarcraft on sale at the “12th Annual World Gardening Fair” at the Hotel Okura Tokyo in May. Ambassadors’ wives from 10 countries worldwide will be presenting original garden displays highlighting trees and flowers from their homelands at this charity event. 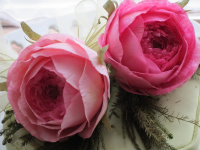 Why not take home sugarcraft flowers, decorations and confectionary that are no less exquisite than the gardens themselves? 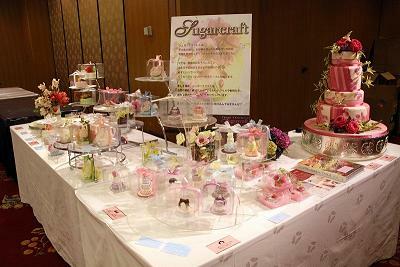 Sugarcraft gifts will be on sale at the sales corner of the main garden event venue (Heian Room). It is an event you won’t want to miss. We hope to see you there!